Topic: Axminster bandsaw nightmare - re customer from HELL!!! mrgrimsdale wrote: Seen it. They seem all to be £90 ish which is too much. It was only a moment of tool lust! Instead I bought this but it hasn't arrived yet. Interesting but possibly useless. That is truly awful. Pretentious crap. They deserve to have their money lifted. I don't know about the sherry but a kitchen company in Newcastle skinned my old man for £18k for a tiny kitchen 6 years ago and the tops were deffo 8-10mm Corian on Chipboard/MDF. 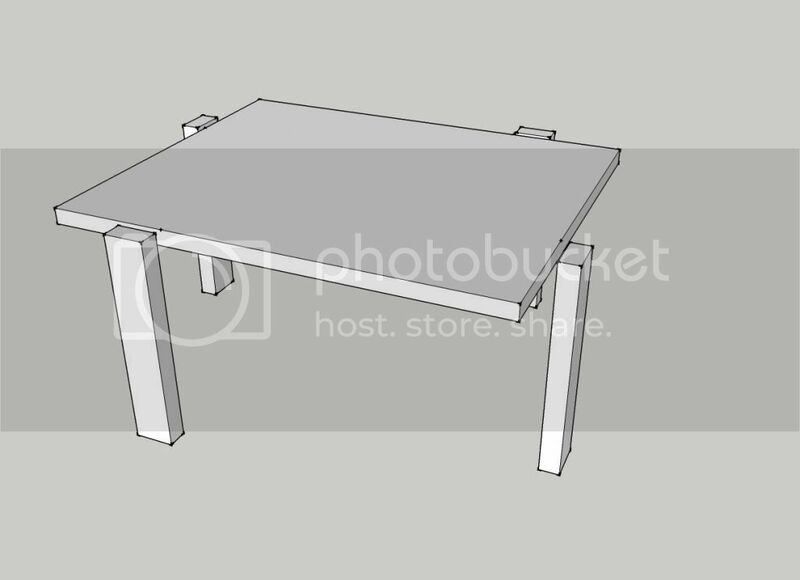 Topic: Who's Table is this? Re: Who's Table is this? mattty wrote: Option 3 for me. I'll change my opinion - good idea Mattty. Looks like good work to me, can't see any snags. Sounds like a bit of a nightmare to do with the timber problems and the client looking over your shoulder. Kool. Is that your design? Posting mistakes is good for the soul. thatsnotafestool wrote: Looks like I may well be needing to 'sander' thickness down a lot of awkward wood. So starting to think that the Jet is too slow. Any suggestions? Don't want to spend mega-bucks. You can borrow mine if you like. Serrated bottom no less for all that resin. Needs a bit of a clean up and no doubt some rounding of the bevel. I've not used it in anger since I inherited it last year. Interesting use of the clamping blocks. I assumed you were going to put them on the corners until I realised there were only 3 sides. There will certainly be a contrast. I had 2 spare sheets of Wenge MDF in the workshop when you were here! Topic: What type of finish gives the highest gloss finish? Re: What type of finish gives the highest gloss finish? Sikkens do a clear marine grade which (I think) available in satin or full gloss. I have used the satin and it is excellent. Western Red Cedar is weather resistant and readily available of you could use tanalised (rot proofed) softwood and finish it with Sikkens or something similar for your choice of colour. Either way should be inside your budget. curious how much they paid. It'll only make you feel worse if it was a lot. I suggest you look at Silestone which is solid, as opposed to Corians timber core and does not have the harshness of granite. I wouldn't use slate as it scratches easily. Careful you don't damage the alloy thread. Entertaining though this thread is I'll stick to the Veritas thanks. Taste doesn't come into it. 1. Does it work? 2. Is it cheap? I was pondering on the mental state required to sell a Veritas smoother in favour of a Stanley.